Follow this link to the iNaturalist field guide for Prairie and Field Wildlflowers of Winnebago County! Bergamot (Monarda fistulosa) is most often seen in dry prairie soils, rocky woods, disturbed areas, and glade margins. It typically grows two to four feet tall, forming dense clumps. Its lavender to light magenta two-lipped, tubular flowers appear solitary, globular groups. Like most members of the mint family, Bergamot has a strong, square stem. It has toothed, opposite leaves that carry a lovely earthy-mint scent. Bergamot is edible and popular as a tea, but it is best to thoroughly wash the leaves before consumption. Bees and other pollinators are attracted to this lovely flower. Burdock (Arctium) is best recognized as a stout, common weed with annoying burrs that stick to animal fur and clothing. This plant grows relatively tall therefore having deep roots which are brownish green, or nearly black on the outside. The basal rosette of leaves stays close to the ground the first year and the beginning of the second. These basal rosettes can grow up to three feet wide. Burdock has purple flowers, growing one to three centimeters across, on tips of prickly ball of bracts that blooms between June and October. 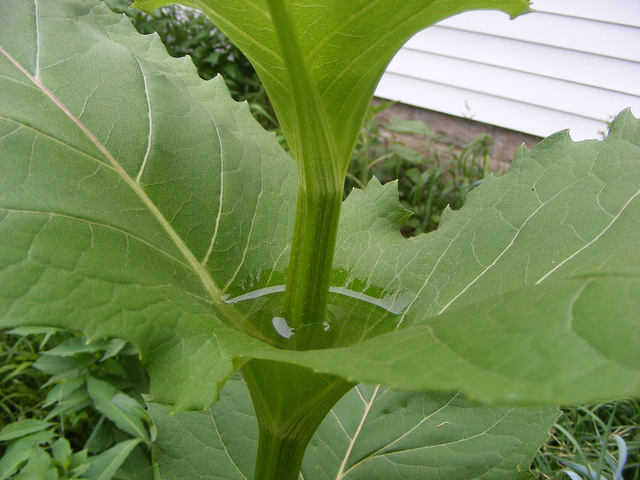 The large, wavy, heart-shaped leaves are green on the top and whitish on the bottom makes identifying burdock easy. Leaves can grow to fifty cm in size. It is known to grow three to six feet tall and live along river banks, roadsides, and in fields. Burdock root is well known for its anti-inflammatory and antibacterial effects. Compass plant (Silphium laciniatum), a member of the Silphium genus like Prairie dock, can grow to heights of eight feet. Its lower leaves resemble those of Pin oak, while the leaves on its stem are smaller. It acquired its namesake from the telltale way its lower leaves usually point North and South in the heat of day, which maximizes water use and CO2 efficiency. It grows a lovely yellow flower that is heliocentric, or follows the path of the sun throughout the day. These plants are incredibly hardy and known to live over a hundred years! The resin in its stem or flower stalk was used by Native Americans and settlers as a chewing gum. Cow Parsnip (Heracleum) is a perennial herb that grows up to nine feet tall. It is robust and hairy with leaves that are maple-leaf shaped, arising from the plant's base and stem, coarsely-toothed, and up to twenty inches across. The flowers are tiny, white, and arranged in flat-topped clusters called umbels at the top of each thick stem. If you find this plant while hiking, be careful about brushing against it because the juices called furocoumarins react with sunlight on one's skin to cause blistering. If you do get the juices on your skin, wash it off as soon as possible. Cow Parsnip is common in beach meadows, on sunny hillsides, and along most roads and trails in many parts of the state. Curly dock (Rumex crispus) is a non-native that is invasive to disturbed areas and prairies, but does not readily invade established habitat. A mature plant can produce forty thousand seeds a year, which can survive in the soil for more than fifty years. It has been estimated that there are five million Curly dock seeds per acre. While these plants are edible for people and have several medicinal uses, they are toxic to livestock and poultry. Its namesake curly, crispy leaves begin as a dense basal rosette, or clump, before sprouting many plain, yellow-green flowers. As they progress into late summer, the flowers shift to a deep reddish-brown. 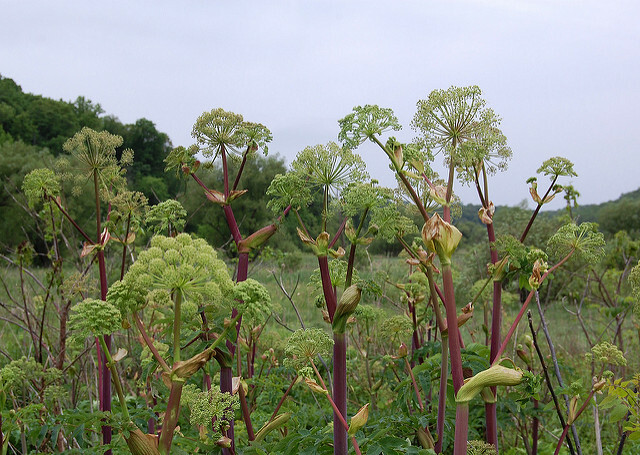 Great Angelica (Angelica atropurpurea) are known for their hollow stems that mature from green to purple and can reach up to nine feet in height. Their long leaf stalks have a green to purple sheath at the base. 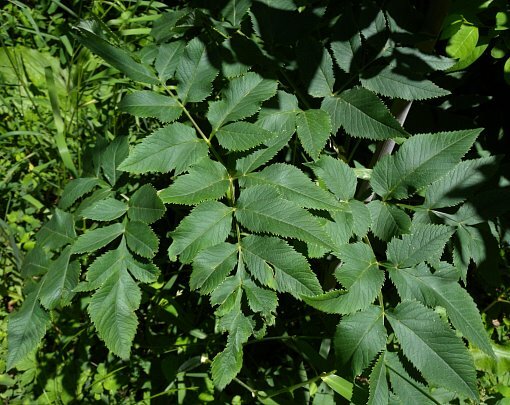 They have compound leaves with three to five leaflets, growing up to four inches long and two inches wide, per branch. The leaflets have sharply toothed margins and occasional fine hairs on the underside. Great angelica flowers are found in convex to round clusters, also known as umbels, that grow from four to nine inches in diameter. Individual flowers are green to whitish in color. Though often confused with Cow Parsnip, which is found in similar wetland and meadow habitats, Great angelica has pinnately compound leaves rather than palmately compound leaves. Caution should be used near this plant, as it contains furocoumarins that cause a reaction with sunlight. Indian cup plant (Silphium laciniatum) is best known for the namesake cup that its leaves form around the stem. Its stout, course leaves join at the stem and collect rainwater, which attracts bird and insect pollinators. Like others in the Silphium genus, this plant grows a lovely yellow flower at the top of a strong, square stem and can grow three to eight feet in height. The gum and resin in the root of Indian cup plant has been used in natural medicine for various purposes. Prairie dock (Silphium terebinthinaceum) is a prairie giant, its flowering head reaching nine feet in height. Its large, sandpaper-y, heart-shaped leaves grow to form a dense clump in the early summer. By late summer, a stout stalk rises with a lovely yellow, sunflower-like bloom two to three inches in diameter. This plant is exceptionally well adapted for droughts, as its roots often grow so deep that they tap into the groundwater system. For this reason, its leaf veins are usually cool from geothermally-cooled water. Settlers used to wear the leaves like bandannas to cool off under the intense prairie sun.